Dr. Sonia Fizek is a game scholar, an aspiring game designer and a digital wanderer, currently living and working in Berlin. In May, she is joining Abertay University as a lecturer and researcher in game theory and design. She is also an associate editor of the Journal of Gaming and Virtual Worlds. Freed from the shackles of work? Industrialisation and automatisation were expected to fulfil the human dream of spending fewer hours working allowing us to devote more time to non-labour activities, such as playing. The machine was supposed to relieve us from the drudgery of mundane, repetitive tasks. During the Industrial Revolution, it would serve as an alternative to human muscle and replace our manual labour at assembly lines and in manufacturing. But in the Digital Revolution, the machine would start taking over tasks dependant on our cognition, such as calculating. As Norbert Wiener proclaimed in the early 1950’s, the automatic machine, when used for the benefit of humanity rather than serving profit-oriented goals, could increase our leisure and, as a result, contribute to the enrichment of our spiritual lives (1954, 200). By and large, the automaton could have liberated humans from the need to work. It did not. Replacing humans in one type of labour, the machine seems to have created other spaces in which the repetitiveness of tasks is realised anew. Only this time, these laborious endeavours are coated in the playful crust of digital games and the World Wide Web. On a wider social scale, the plenitude of free time has not become reality. Despite being proclaimed a ludic century, in which play is to become the dominant socio-cultural form (Zimmerman, 2013), the 21st century is far from reaching the age of leisure and abundance, “for we have been trained too long to strive and not to enjoy” (Keynes, 1963). This logic of purposefulness seems to be further intensified in the digital sphere. The constant development of the Internet is driven by the free cultural and technical labour of its users, who perform numerous tasks, such as writing fan fiction, modifying existing software and video games (developing “mods”), managing communities, and sharing content via social networks, amongst many others. In the age of digital economy, all the above leisure-related, playful, and free activities are assigned monetary value. After all, free labour is not only based upon idealism of the abundance of creativity and community building, but also on the capitalistic understanding of knowledge as added value. More importantly, free digital labour is performed voluntarily and is perceived as a pleasant activity – “[i]t does not feel, look, or smell like labor at all” (Scholz, 2013 pg. 2). This aspect is particularly interesting as it blurs the distinction between leisure and work, so that everything we do in life is supposed to follow the productivity logics and contribute to the development of digital economy. The above rationale naturally crept into the most ubiquitous pastime activities of the digital era – gaming. World of Warcraft (2004), one of the most popular games of the digital era, apart from being an online fantasy with millions of people engaging simultaneously in collective mimicry, may be also seen as a factory, a sweatshop (Galloway, 2013) or a for-profit virtual world (Nakamura, 2013). The deadly uninteresting nature of repetitive tasks that Wiener heralded as being on the decline in the automation age seems to be gaining its second life in massively multiplayer online role-playing games. In order to level up their avatars, players undertake monotonous tasks, such as fighting ever more powerful monsters, collecting in-game items, or improving trading skills. This highly repetitive process of “grinding,” while being part of the game, for some becomes a virtual assembly line. It contributes to the rise of a new class of players – the so-called work-players (Nakamura, 2013) or “playbourers” (Kücklich, 2005) who spend hours in the game world to acquire virtual goods and later sell them for real money. For those “gold farmers,” playing translates directly to working, which constitutes an illustrative example of for-profit economy of contemporary MMOs. And since the economy is literally dependant on playing, it has been defined as play economy or ludic capitalism (Galloway, 2013). This seemingly mutually exclusive work-play joint venture gained worldwide attention with the rise of Alternate Reality Games (ARGs). Collectively, we spend three billion hours a week gaming. Why not turning this affluence of pastime into productive time, asked Jane McGonigal (2011). To prove her point, she designed ARGs, such as World Without Oil (2007), “a massively collaborative imagining of the first 32 weeks of a global oil crisis” (worldwithoutoil.org). The vision of using games collaboratively to solve global social issues was put into practice already in 1961, when Buckminster Fuller introduced an analogue World Game in order to address the problem of overpopulation and uneven distribution of global resources. Similarly to the more current digital counterparts (ARGs, games with purpose, serious games etc. ), it encouraged the players to cooperatively solve a set of potential scenarios in order to approach the problems of the world. However, the division between work (especially in its non-Marxist understanding of self-alienating drudgery) and play cannot be perceived according to a strictly dualistic logic. For as much as playfulness enters spaces associated with work or seriousness, work elements permeate and influence playgrounds. The work-play relationship is neither fully embraced by the concept of gamification (Deterding et al., 2011) nor that of its opposite, labourisation (Dippel & Fizek 2015; 2016). The gradually dissolving distinction between the two qualities may be more accurately discussed within the framework of work-play interference (ditto), or work/play interplay (O’Donnell, 2014). The productive sort of gaming, intertwining work and play, has been perfected in the most recent ludic phenomenon – citizen science games (also known as data games or games with purpose). They constitute big data collaborative ludic spaces in which players solve puzzles, categorise, identify and tag data, and by doing so contribute to the advancement of various branches of science Through playing thousands of amateur scientists help researchers deal with numerous questions, from biology, neuroscience, astronomy, to linguistics and history of art, amongst others. The players predict protein patterns (EteRNA), map neural retina pathways (Eye Wire), categorise galaxy shapes (Galaxy Zoo), tag social language (Metropolitalia) or art works (ARTigo). 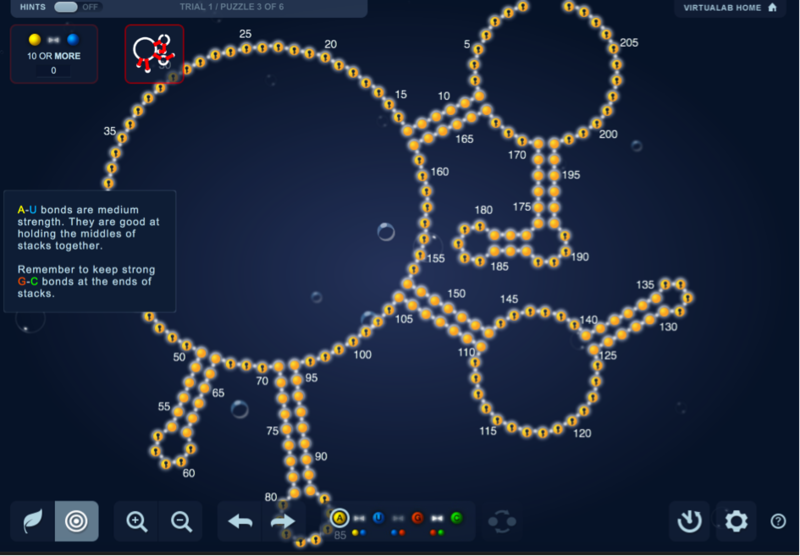 FoldIT (2008) was one of the first citizen science games, developed as an online challenge for synthesising molecules. The input from this online playful laboratory turned out to be so successful that its initial prototype transformed into a worldwide ludic experiment renamed EteRNA (2010). Currently more than 38.000 amateur scientists participate in the playful activity of recognising and restructuring patterns (see illustration below). The game is essentially a two-dimensional puzzle, in which the players are asked to design structures composed of four element types that make up the RNA (ribonucleic acid) molecules: adenine, guanine, uracil and cytosine, represented by distinct colours (yellow, red, blue and green respectively). The players are encouraged and rewarded on numerous levels by the game’s system – from progressing to ever more complex levels, receiving points and badges, to acquiring status in the community (gaming leader boards), and finally recognition by the scientists, who synthesise the best virtual designs in their laboratories at Stanford University. Since these online ludic laboratories are considered a priori pleasurable and leisure-oriented game spaces, they are especially successful in enabling “productive activities of connected human minds” (Terranova, 2013). This productivity, however, is based on a voluntary decision. Citizen science players are neither forced, nor motivated by the monetary compensation for hours of their immaterial work. Similarly to other participants of the digital economy, they act out of their own desire for cultural production. They are willingly contributing to the development of knowledge. The immediate leverage of a playful and pleasant activity with a socially productive outcome, the element of competition in a large collaborative environment, and the feeling of belonging to a community with a common goal, seem to be the basis for the success of citizen science games. The idea of changing the world by turning gaming into something productive embody a contemporary romantico-cybernetic understanding of play (Galloway, 2013). On the one hand, play is perceived as a spontaneous and almost childlike activity. On the other, in many instances, it has become almost synonymous with complex iterative systems. Commercialisation and systematisation of play, gamification, or productive collective gaming operate in accordance with the systemic and structural quality of play. At the same time, they draw from the Huizingian spirit, associating play with something pure, almost poetic, and above all else meant to entice pleasure. And this romantico-cybernetic fusion does the trick – players are invited into the world of something they intuitively associate with fun and frivolity, all the while performing repetitive and monotonous tasks, which bring to mind automated machine-like processes. What remains fascinating in citizen science games is the relationship between the human, the machine, and the data. The human agents contributing to research in big data collaborative online games for science are of two kinds – the scientist and the citizen science player. Their roles played out in the human-machine assemblage are distinct and contrasting, although both of them rely upon the ludic simulation. A team of scientists in the laboratory (e.g. Stanford University) is analysing the already sieved data in search for the significant pieces. The deluge of data is classified, labelled, and identified by players, each sitting in front of their own computer, which, together with thousands of other calculating machines, form a networked production line. In this sense, citizen science games or other data games may resemble virtual assembly lines where big data is perfectly mined in an iterative factory-like system. The machine, on the other hand, stores the big data, runs the game, calculates the results delivered by thousands of players, communicates between the players and the scientific team, and networks the whole community. Most importantly, it learns from the human behaviour. Currently, humans are excelling at solving puzzles and predicting patterns – skills that form the basis of data gameplay. The question is whether the unparalleled power of the human brain may soon be replaced by such algorithms as EteRNA Bot, which is already on its way to synthesising excellence. The learning and playing digital machine is enticing fears born in the age of industrialisation and automatisation. Some journalists paint bleak visions of future games in which humans are not competing against one another, nor against machines, but are serving as “intelligence-gathering slaves“ in a playful factory simulated by a digital brain. In this case the anxiety surpasses the old demons of the Industrial Era, where machines were taking over tasks performed by the humans. For some there seems to be something deeply unsettling about the fact that machines are no longer merely the tools for the simulation of the playful worlds, but also the autonomous players in those very worlds (see the AlphaGo playing system, which in January 2016 defeated a human player for the first time in history). We should realise, however, that such fearsome visions are still deeply rooted in the model of human-machine co-existence, where the main role of people is to supervise machines, and the main role of the machines is to obediently perform upon the human command. In our digital era, when machines are ever more present and refined, we need to constantly re-negotiate and re-think their place in our everyday lives. Or, give up the anthropocentric perspective altogether, and accept the human-machine tandem as an integral part of the digital landscape, in which neither one side nor the other is in the privileged position and both, following the argument by a German media theorist Friedrich Kittler, exhibit distinct forms of autonomy: “machines and humans come together not as surrogates or substitutes for one another, but as co-functioning elements in larger sensory systems” (in Hansen, 2015 pg. 224). The brief ludic musings proposed here are speculations based primarily on the current playful digital phenomenon of data games and an extended metaphor of productive gaming as working. Both concepts are closely intertwined with computing machines, and the question of the relationship between the machines and the human agents. Are we accepting the autonomy of the first, or guarding the superiority of the latter? Are we fearfully anticipating ever more powerful non-human players, or embracing the role of machines (algorithms, bots or robots) in our everyday? After all, the rules of the game between the two may change just as in the croquet match played out on the pages of Alice in Wonderland, “where balls are hedgehogs which walk off, the hoops are soldiers who march to other parts of the field, and the rules of the game are made from instant to instant by the arbitrary decree of the Queen” (Wiener, 1954 pg. 193). Building upon Lewis Carroll’s metaphor, Weiner refers to Marxist and fascist Queens of his time in the wake of World War II. The question remains – who is stepping into the Queen’s shoes today? Is it the capital represented by such corporations as Google, who, like others, support data games and have thousands of players at their disposal for building ever more intelligent and autonomous algorithms? Or, simultaneously, is it governments that are closely cooperating with big business? Or, maybe the empowered digital citizens, ready to play hand-in-hand with AI? What is at stake in the human-machine tandem seems to be particularly shining through various types of big data games. At their core, neither the repetitiveness of tasks performed by the humans nor the calculating supremacy of the machines are negatively charged qualities. It seems humankind needs those predictable patterns of self-improvement. And if apart from daily chores, these patterns are realised in online citizen science games, so be it. It is, however, the context of “playbour” that makes all the difference. If the free labour of thousands of human players is used to envision and develop powerful algorithms, which will serve capital-driven parties, we have reason to be concerned. In the past few years, Google has been investing in artificial intelligence projects such as DeepMind. The company also provides financial support to some research teams standing behind citizen science ludic projects. Not only does the relationship between work and play, or machines and humans need careful study, but also the alliance between science and the capital that is shaping the former. But above of all, let us not be too easily fooled by the vision of playing machines. For the machine performs exceptionally well in the cybernetic games, but struggles in much less formalised playful endeavours: like living from imprecisions, ambiguities, or poetic language (linguistic puns or games based on refined literary descriptions such as Dear Esther or The 39 Steps, amongst others). Let us not strive to turn all our games into useful machine-simulated big data worlds, and engage in both strategic anticipatory games as well as emotion-stirring poetic plays that feed the conscious and logical mind as much as its unconscious counterpart. After all, “the world is many things, and no single framework is large enough to contain them all, neither that of man’s science nor that of his poetry, neither that of calculating reason nor that of pure intuition” (Weizenbaum, 1976 pg. 277). The first version of this article has been published in the 2015 autumn issue of the German TUMULT magazine. Many ideas elaborated upon in this essay were inspired by or came directly into being during an on-going research on play and work with an anthropologist Anne Dippel. Galloway, A. (2013). The Interface Effect (e-book version). Malden, MA: Polity Press. Dippel, A., Fizek, S. (2015). Playful Laboratories. The significance of games for knowledge production in the digital age. (paper presented at: Digital Games Research Association, DiGRA: Diversity of Play, Centre for Digital Cultures, Lüneburg, Germany, May 14-17, 2015). Dippel, A., Fizek, S. (2016, in print). Laborious Playgrounds: Citizen science games as new modes of work/play in the digital age. In R. Glas, S. Lammes, M. de Lange, J. Raessens, I. de Vries (eds. ), The Playful Citizen: Knowledge, Creativity, Power. Amsterdam: Amsterdam University Press. Hansen, B.N.M. (2015). Symbolizing Time: Kittler and Twenty-First-Century Media. In S. Sale and L. Salisbury (eds. ), Kittler Now. Current Perspectives in Kittler Studies. Cambridge, UK: Polity Press. Keynes, J. M. (1963). Economic Possibilities for our Grandchildren. In Essays in Persuasion. New York, NY: W.W.Norton & Co.
Kücklich, J. (2005). Precarious Playbour: Modders and the Digital Games Industry. Retrieved from: http://five.fibreculturejournal.org/fcj-025-precarious-playbour-modders-and-the-digital-games-industry. McGonigal, J. (2011). Reality is Broken. Why Games Make Us Better and How They Can Change the World. London: Jonathan Cape. Nakamura, L. (2013). Don’t Hate the Player, Hate the Game: The Racialization of Labor in World of Warcraft. In T. Scholz (ed. ), Digital Labour: the Internet as Playground and Factory. New York, NY: Routledge. O’Donnell, C. (2014). The Developer’s Dilemma. The Secret World of Video Game Creators. Cambridge, MA: MIT Press. Scholz, T., (ed.). (2013). Digital Labour: the Internet as Playground and Factory. New York, NY: Routledge. Terranova, T. (2013). Free Labor. T. Scholz (ed. ), In Digital Labour: the Internet as Playground and Factory. New York, NY: Routledge. Weizenbaum, J. (1976). Computer Power and Human Reason: from Judgement to Calculation. New York, NY: W. H. Freeman and Company. Wiener, N. (1954). The Human Use of Human Beings: Cybernetics and Society. Boston, MA: Da Capo Press. Zimmerman, E. (2013). Manifesto for a Ludic Century. Retrieved from: http://kotaku.com/manifesto-the-21st-century-will-be-defined-by-games-1275355204. Karen Schrier is an Assistant Professor at Marist College and Director of the Games and Emerging Media program. Her book, Knowledge Games: How Playing Games Can Help Solve Problems, Create Insight, and Make Change, will be published in May 2016 (Johns Hopkins University Press). She holds a doctorate from Columbia University, master’s from MIT, and a bachelor’s from Amherst College. Your essay deftly uses games to discuss tensions between work and play, machines and human beings, and scientific research and commercial interests. These tensions become more visible in part due to the perceived and real power disruptions that arise when knowledge-making occurs through games. First, you challenge conceptions of play time as being “non-work” time. You appear to refer to Postigo’s and Jhally’s idea of the “working audience,” as well as Smythe’s concept that the audience is itself a commodity that can be bought, sold, and consumed. Despite the fact that our leisure time is expanding, we could argue that it is still being usurped for its surplus value. We are “working” even when we’re not, whether through our watching of advertising, the crunching of data for citizen science, liking of Facebook posts, or the playing of games (Fuchs, 2014). The metaphor of “game as factory,” however, becomes less useful as we consider whether this type of labor is problematic. As Tiziana Terranova writes, “Free labor, however, is not necessarily exploited labor” (2000, 48). Unlike that of a top-down factory, what if players are also using their labor to fulfill passions, find new careers, subvert norms, or cure cancer? Do these games enable more voices to be involved in knowledge production, or do they give an illusion of power, only to maintain hegemony? We need a new metaphor to help us consider whether the labor is exploitative, coercive, or immiserating (Andrejevic et al, 2014), and disentangle the complexities of the power relationships. Second, you also contemplate the disruptiveness of humans and machines making knowledge together through games. Luis von Ahn uses the term “human computation” to describe how computers and human beings can partner to more effectively create new knowledge, by each doing what they do best (2005). I call these types of games–which build knowledge through human computation–knowledge games (Schrier, 2016). For instance, Foldit, EteRNA, and Play to Cure: Genes in Space combine the problem-solving powers of human beings with the algorithmic abilities of computers. The potential is exciting: these in-game activities could lead to real-world cures, classifications, and changes. But, as you rightly question, what happens when human beings and machines co-create knowledge? Is there a potential power upheaval? Does knowledge production become transmogrified if machines are helping to produce science? What about knowledge of art and poetry, history and philosophy, or knowledge that might lead to social policies, psychological interventions, or new ethical frameworks? Or, should we question all knowledge production—whether through a game or not? Does the existence of knowledge games help us to question knowledge-making itself? These interrogations tie into your third act, where you fittingly problematize the relationship between corporate entities, such as Google, and scientific knowledge making. To add to these questions, we must also consider the necessity of ethics and values to knowledge-making. For instance, the role of the university has historically been not only to create and transmit knowledge, but also to cultivate an engaged citizenry who can critically evaluate it and use it to make constructive societal changes (Habermas, 1970). Moreover, what are the ethical implications of using so-called Big Data to drive knowledge-making (boyd & Crawford, 2012)? What happens if only corporate interests or data scientists are interpreting data, creating new knowledge, and setting the research agenda? Knowledge games are part of our present and future. Just like any form of knowledge-making, we can use them to ethically innovate, or we can use them to immorally destroy. Andrejevic, M., Banks, J., Campbell, E., Couldry, N., Fish, A., Hearn, A., & Ouellette, L., (2014), “Participations: Dialogues on the Participatory Promise of Contemporary Culture and Politics, Part 2: Labor,” International Journal of Communication, 8: 1089-1106.
boyd, D. & Crawford, K. (2012). Critical questions for Big Data: Provocations for a Cultural, Technological, and Scholarly Phenomenon,” Information, Communication, & Society, 15, no. 5: 662-79. Fuchs, C. (2014). “Digital Prosumption Labor on Social Media in the Context of the Capitalist Regime of Time,” Time & Society, 23, no. 1: 97-123. Habermas, J. (1970). Toward a Rational Society: Student Protest, Science, and Politics. Boston, MA: Beacon Press. Jhally, S. (1987). The Codes of Advertising, New York, NY: Routledge. Khatibet, F., et al. (Oct. 2011). “Crystal Structure of a Monomeric Retroviral Protease Solved by Protein Folding Game Players,” Nature Structural & Molecular Biology, 18, no. 10., 1175-77. Postigo, H. (2014). “The Socio-Technical Architecture of Digital Labor: Converting Play into YouTube Money,” New Media Society. Schrier, K. (in press, 2016). Knowledge Games: How Playing Games Can Solve Problems, Create Insight, and Make Change. Baltimore, MD: Johns Hopkins University Press. Smythe, D. (2001). “On the Audience Commodity and Its Work,” reprinted in Meenakshi Gigi Durham and D. Kellner, Eds., Media and Cultural Studies KeyWorks, Malden, MA: Blackwell. Terranova, T. (2000) Free Labor: Producing Culture for the Digital Economy, Social Text 18, no. 2., 48.